This weekend, for the first time since I was 15, I shall be applying name labels to school clothes and school bags. Ah, the joys. Name labels have come on quite a long way since my school days and the range of Tinyme Name Labels features fun, bold and funky name labels to suit all of your labelling needs! Tinyme sent Lara one of their bumper value packs of name labels to try out for her very first days at school. I think the Basic Variety Pack of name labels is a great introduction to the Tinyme range and has everything I need for this first term at school - I should be able to label all of Lara's clothes, PE kit, bags and lunchboxes with this set. My favourite items from the set are the vinyl labels as these are really durable and so easy to apply. They are waterproof, dishwasher resistant and microwave safe so they are perfect for putting on lunchboxes. I've used them on Lara's school bag too and they seem to have stuck really well. I was also impressed by the iron-on labels. Not owning an iron, I was slightly worried about how I was going to apply them but a bit I'm not one to give up that easily! The iron-on name labels come with a protective sheet that you hold over the label as you press down with the iron... or in my case, with a hot pallette knife! Once applied, they sink into the fabric of the clothes and can withstand a washing machine or tumble drier. Sooooo much easier than sewing them on! The pack also contained some clear plastic circles that you can apply over the top of one of the standard round vinyl labels if you put them inside a shoe - this helps to protect the label from rubbing and sweat. Ordering from the Tinyme website was very easy once I had selected my variety pack and the design I wanted. I chose the Name I wanted and chose from a small range of fonts for the lettering. My labels arrived within the week. I think the selection pack is quite pricey but the labels are really good quality and durable. I think that in the future I would order a specific type of label as there is a much wider range of designs available this way and you can choose just the types of label you know that you would use, having tried them all out in the value pack beforehand. Earlier this week Lara got to meet one of her TV idols on a really inspiring trip to London. I think Lara is pretty unusual for a 4 year old in that she knew and recognised french chef Raymond Blanc; in fact, having recently enjoyed watching Raymond's BBC2 series How to Cook Well, Lara had been beside herself with excitement before our trip to Covent Garden this Wednesday. Lara was invited for a cookery lesson with Raymond as part of the launch of a new iPad app by Raymond's son, Olivier. The app in question is Henri Le Worm : The Missing Cookbook which I intend to review on my blog in the very near future (it is fab) and it features a french chef (Henri le Worm) and his garden friends and is designed to encourage an interest in food and ingredients in children from 2 years upwards. The app also features a handful of recipes from Raymond Blanc for cooking and enjoying with kids. If you know anything about me and my food mantra for kids then you'll know how perfect this app and its goals are for Mellow Mummy. Our morning at Brasserie Blanc in Covent Garden was great fun. When we arrived, the only other people there were the creators, Olivier Blanc and Charlotte Salt and one of my own comedy idols, Simon Pegg with his gorgeous daughter who was a little younger than Lara. After a breakfast of fresh fruit and croissants there were the obligatory speeches and general congratulations and then came the important part - the cookery lessons. The restaurant had been laid out with lots of individual cookery stations for the children. Raymond demonstrated the cookery skills with enthusiasm and plenty of arm-waving. He sang nursery rhymes and raved about great food and quality ingredients. He oohed and aahed and really encouraged and congratulated each of the children on their achievements. I thought he was hilarious but I'm not convinced that Lara could understand anything that he said... so we were thankful for some really talented chefs who stepped in to help the children where needed. Lara took it all very seriously (as she does with most challenges she takes on) and was genuinely interested when I 'translated' to her Raymond's speech about the importance of animal welfare in egg production. I don't think Lara and I need converting to the cause of encouraging a love of great food and ingredients from a young age.. but it was very inspiring to hear both Raymond and Simon Pegg rave about how important an interest in food is for our children. Lara made the most amazing chocolate mousse (helped I think by a really really good quality of chocolate) and enjoyed whipping the egg whites immensely. We took the mousse home with us and enjoyed it as a picnic on the train! She also made and decorated these mayonnaise mice (one of the recipes from the Henri Le Worm app) from which she stole the salad (she isn't much in to mayo... even if it is home-made). Raymond gave Lara a high five for her decoration which bought the most enormous smile to her face. Lara and I completed an amazing day with a bit of shopping in Covent Garden, an indulgent lunch and then a movie at the cinema. I wish all days were this amazing. Given my renewed interest in decorating cakes for (and with) my daughters, the timing of the new Eaglemoss magazine collection, Disney Cakes and Sweets couldn't have been sweeter! The first edition of this weekly publication is released on the 4th of September but Lara and I got a sneak preview and got to work on our creations straight away. Disney Cakes and Sweets isn't really intended as a children's cookery magazine; in fact, most of the recipes are well beyond a preschooler. I would go as far as to say that several of the recipes are something I would want to shut myself away in a room to cook, without the distractions of a child... Sleeping Beauty's Marshmallow Pillows for instance sound unlike anything I've ever attempted to cook before. And the star of the show is a step-by-step guide of how to bake, ice and decorate your own Disney castle showstopping cake (the steps are distributed across several editions). The first magazine in the Disney Cakes and Sweets collection came with two free products - a pair of Winnie the Pooh stencils and a Mickey Mouse Cookie cutter. Winnie the Pooh's Honey Cupcakes were a really interesting take on a simple sponge cupcake recipe - using wholemeal flour, cinnamon, nutmeg and honey. I can honestly say that I really really enjoyed the cakes because they were so unusual. Using my new-found cupcake icing skills, I helped Lara to ice our cupcakes with a gentle yellow coloured butter cream. The Disney Cakes and Sweets magazine had a few simple guides in the back of the magazine of how to colour and ice cakes with different types of icing (although I would say that my recent hands-on tutorship really helped me). After the buttercream had set a little, we used a paintbrush to brush edible glitter over the Disney Winnie the Pooh stencils - Lara LOVED this part! The gingerbread Mickey Mouse faces went down a storm at the barbecue. To me, Disney Cakes and Sweets is a great source of inspiration and I think that the free cookery gadgets and Disney accessories with each edition will be great for children's cookery and for birthday parties. I now just need to find myself an occasion to make a 101 Dalmations cake! A little under a year ago Lara was given a Lego friends T-Shirt and it instantly became her favourite item of clothing and, given the quality of the t-shirt, I was happy to agree with her that it was a piece of clothing worth wearing again and again. I had been on the lookout for another few pieces of clothing for the girls and when Zalando asked Holly and Lara if they would like to review something from their children's clothing range I was really excited to see that they stock a huge number of pieces from the Lego wear children's clothing range. Zalando features good quality yet affordable clothing all at a good discount. The clothes in the Lego Wear range are all at a discount of between 15 and 35%. Even so, the Lego clothes are a little more expensive than I would normally pay for a t-shirt or a long-sleeved top (especially if the girls will be wearing the clothes to nursery) but I knew from experience that the quality of the fabric and the print of the Lego Wear clothes is a lot better than many other items of kids clothing we own; the fabric is thicker, stronger and softer and always holds its shape. I chose Lara this long-sleeved top which features the same pattern as her favourite Lego Friends T-shirt but in a different colour. Lara has really got into Lego Friends this summer so she gets excited when I lift this top out of her wardrobe for her. The long sleeves should see her through the winter. I also wanted to get Holly a long sleeved top for the Autumn and I managed to find one of the Lego friends tops which went down to her size - I love the cute Panda design and it really suits her. The fabric on this top is so thick and soft that it almost feels like suede. To see us through the end of Summer, I chose this really bright and bold Lego Wear t-shirt for Lara. It is also another Lego Friends print but because it is made with big colour blocks and shadows, it isn't as obviously girly and I think that suits Lara really well. I have continued to be really impressed by the Lego Wear range of kids clothing from Zalando - fun, bright and practical without sacrificing quality. In a little under three weeks my baby girl will start school. While I struggle to come to terms with how quickly this has happened, I think we are both quite looking forward to it. It is going to be a period of change for us, a totally new routine - for Lara, a new set of friends... for me, the joys of a school run (I'm still not entirely sure how this is going to turn out, given my working day). Tesco F&F Clothing asked us to try out a few pieces from their back to school range for Lara and something to help me look that little bit more stylish on the school run (one has to look ones best you know!). As you probably know by now, Lara's school doesn't actually have a formal school uniform (other than for PE... which is slightly weird) so I chose Lara a selection of simple school basics such as trousers, cardigans, fleeces and Polo shirts. Lara has managed to pull of the smart-casual look of a Polo shirt really well I think! It is exactly the look I was going for. The jersey cardigan is very cool and I think would work well in or out of school. + The pack of two pique polo t-shirts cost just £2 and for that I was expecting dubious quality but compared to other polo shirts Lara has owned (and which I already got her for school) the quality is better. + Lara is very tall for her age so I was really pleased that I was able to order longer-length trousers for her. This makes a big difference because normally I have to order a couple of sizes larger than her age which can result in trousers being baggy around the waist. + The trousers are coated with Teflon® to try and repel stains and protect the fabric so hopefully they should last through some of the strains of foundation play! - I didn't feel that the adjustable waist band on the trousers (standard on most Tesco uniform items) offered a big enough degree of adjustability. - The fabric on the trousers was a bit rough and a little thin - they reminded me of clothes I wore to school and didn't enjoy. Hopefully Lara won't hold it against me! I liked the fact that I could order all of Lara's school uniform online with Tesco F&F for delivery to my local store. I managed to pick up these plimsoles with a cute butterfly design on them for £3.50 along with double-pack of cycle shorts for PE, a zip-up fleece for outdoor sports and also some white socks and underwear to complete the new school kit. Mobile By Sainsbury's - Enough to make me move to PAYG? Today we are celebrating the dawn of a new era. After 9 years with my current mobile phone provider I have finally found an alternative provider who can meet my needs - and I'm a very fussy mobile user! When Mobile By Sainsbury's sent me a phone and a voucher with which to perform my first top-up, I had actually been in the process of researching new phone and tariff alternatives as my current mobile contract (that I have renewed every 12-18 months for the past 9 years) is due to come to an end next month. Every year I consider moving to a PAYG phone and every year I decide that PAYG isn't for me... until now. I expected to try out the new Sainsbury's mobile phone service, enjoy it, and then default back to my tried and trusted phone and provider but actually, I've been genuinely impressed enough to make the big move of letting my contract run out so that i can permanently move over to Mobile By Sainsbury's. Nectar points! Not only do you get Nectar points on your top-ups but also, when you buy a monthly bundle you get double points on your shopping for the lifetime of that bundle which means that the points quickly add up. I'm currently saving my Nectar points for Christmas presents for the girls. There is good flexibility - you don't HAVE to buy a bundle in order to use your phone. In fact, if you really are a very low user then you can even change your tariff to get better call and text rates than if you make ad-hoc calls outside your bundle when you're on the bundle plan. It is soooo easy to top up. It is 9 years since I last had a PAYG phone so I was a bit out of practice when it came to top-up but I have found topping up to be phenomenally easy using the top-up card linked to my phone number so I can get the card swiped in Sainsbury's stores to pay for credit OR I can buy a top-up from any mobile top-up seller and then register it by phone later on. As to the phone... well, Mobile By Sainsbury's have a small selection of phone available (one handset for as little as £12). The Sony Xperia is one of their top of the range handsets. It runs Android and I've found it to be really fast when running apps and accessing wifi networks. I'm impressed by the colour touch screen and with the ease of integration with many of my online accounts, specifically my google accounts which means an almost seamless access to my mails, contacts, G+ and browser history. Mobile by Sainsbury's runs using the Vodafone network and I've found the reception to be good at home, at work and one the move... even in the wildest depths of Cornwall when we went on holiday. So all around, I'm a very happy bunny...hence the champers! So, when my current contract finally runs out next month, I am planning on moving my existing mobile number over to my new phone on Mobile by Sainsbury's. Anything with a Winnie the Pooh theme is an instant hit in our house but I hadn't realised quite how taken 1-year-old Holly was with Winnie until Tomy sent her one of the new Dancing Pooh plush toys to have a bit of a dance to. Holly thinks he is awesome. This Dancing Pooh toy has a motor which allows him to bob up and down and wiggle left to right as he sings a ditty or two. There are two modes - one in which Pooh bear sings, and the other in which he more or less just humms (for people that don't necessarily understand his words). When you press his left hand, Winnie the Pooh sings his favourite song "Up, Down, Touch the Ground" while wiggling on the spot. When you press his right hand, Pooh sings a tum-ti-tum song and stops occasionally. It took me a while to work out that this was in fact Pooh bear trying to encourage the girls to play musical statues. Even now I know it, it still isn't immediately obvious and despite me having explained this to Lara and Holly, they don't see it as musical statues as the pause isn't long enough for them to notice he has stopped singing and bopping! Despite this, the girls think he is a lot of fun and will spend quite some time pressing his hand and giggling... I think they just like to hear his funny, familiar voice. Holly seems most impressed with Dancing Pooh and likes to hold his hands while he dances. I think Lara (4 years old) is a little less impressed because she owns her own Master Moves Mickey which is also a motorised dancing toy with a lot wider repetoire of fancy dance moves and songs. I would say that I have been a little disappointed with the variety of songs or phrases that Dancing Pooh has to offer and I think because of this, Lara certainly has lost interest quickly. However, at the weekend we did all get together as a family and have a little bit of a dance to Pooh's Up and Down song so I admit that it does get us moving and smiling. I like Pooh's gentle wiggle up and down (although the motor is quite graunchy and can often be hear over the sound of his voice) but I'd like to see him perform some slightly more energetic moves to get the girls moving around the living room themselves. This Summer, Leapfrog have been running a Summer School on their facebook page with loads of great daily ideas of run yet educational activities for children to help keep their little brains ticking over this summer. Lara is getting really excited about starting school this summer so we have been doing some of the Leapfrog Summer School activities together. Last week we were on holiday together with all of my family in Cornwall and yet, every day, there were learning opportunities for Lara. Every minute of the day brought new experiences and she lapped up every new learning challenge. Here she is planning what she was going to write in her postcard back to nursery, one of the writing challenges from the Leapfrog summer school. Since we got back from holiday, Lara and I have started building a scrapbook of her trip which acts as a form of travel diary - another one of the Leapfrog Summer School ideas which you can do even if you aren't going away this summer. The Leapfrog Summer School asks you as a parent to pledge to spend as little as 20 minutes a few times a week to help encourage your child to write, read, listen or learn with a fun activity such as playing i-spy (great for travelling together as a family this summer). There are pledges to help your child write or read a poem, or to fill in a wordsearch - most of the activities have free printable activity sheets to help you out if you need further inspiration. For me, Lara's preparation for school isn't just about reading and writing - I'm also trying to encourage her creative side too. We have filled our dining room with 'doodle drawers' of craft materials such as ribbons, play dough and glitter and have given her free reign with a glue stick (!!!) to let her imagination run wild. This really helps bring out the best in Lara and this weekend she sat for a full two hours to make a card for her best friend made out of glitter glue and pencil sharpenings!!! For Lara this was also a learning opportunity because she really wanted to write on the back of the card herself and I could hear her sounding out the letters to write about Shooting Stars (we had taught her about these on holiday). So, if you are looking for a little more inspiration for activities with the kids this summer, take a look at the Leapfrog Summer School for some quick and easy learning ideas. The Mellow family recently got the chance to test drive the new Citroen C4 Picasso. While I have a comprehensive family car review of all the family-friendly features that the new C4 has to offer over on www.parentwheels.co.uk , I really wanted to rave to you here about the number one feature on the Citroen C4... it is a car that parks itself! Magic. The thought of a self-parking car absolutely fascinated me. I'm notoriously bad at parking and when I found out that Citroen were asking us to perform a parking exercise, I began to get worried! But the magic of the Citroen 360 degree Park-Assist technology (available as an option on the new C4 Picasso) is that you don't have to stress about getting the right angle when you parallel park, or about approaching a parking bay from the correct angle; the car does that for you! Genius. All you have to do is to apply the gas or the brake (and the parking sensors help you make the decision when to brake). The C4 is packed full of other awesome tech too - self-tightening belts to warn you of danger, blind-spot monitoring, sensors to spot whether you drift off into another lane, self-managing cruise-control and also (and this is a winner for most families) three full-sized adult seats in the back, each with ISOFIX fittings including the top-tether anchor point in the boot. The boot itself is the largest for a car of this class so has plenty of room for pushchairs. Yellow Moon sell all sorts of creative and fun children's toys and activities at great prices. From craft kits to science sets, and from learning toys to sticker sets, Yellow Moon have a massive range of kids activities to fill the summer holidays! We were sent a box of Yellow Moon Party Bag favourites to try out. Yellow Moon describe their range of toys and gifts as ideal for pocket money purchases or as 'budget-busting' party bag fillers but I think they also make great little treats to offer as rewards for good behaviour or as side-track techniques to avoid holiday boredom. Lara is at an age when part-bag toys are still a great source of magic and wonder for her. A small cheap toy can provide a short burst of excitement and entertainment. These brightly coloured funky Shades cost £1.74 for a set of 4 pairs - they come in star, butterfly and heart shape. I did actually venture into town wearing a pair myself! Lara thinks they are the epitome of style. I am planning on taking these dinosaur and animal sticker activity books on holiday with us as I think they will be great rainy-day activities for the girls and will help us pass some quiet evenings. They cost £1.80 for a pack of 6 and because they cover different themes such as dinosaurs and beach creatures, they cover lots of different tastes. Also in our party pack we found these traditional party bag toys such as Frog Hand Clappers (£1.60 for 4) , Launching Gliders (£1.99 for 4), Ice Cream Sponge Poppers (£1.80 for 6) and Marbled Jet balls (£1.60 for 6) and some fun word search books (£1.99 for 8) which are suitable for slightly older children. Balls are always a remarkable success in party bags and these Atom balls look like squiggles of rubber but in fact they are balls with an incredible bounce to them! Great fun. Perhaps the biggest success in our Yellow Moon delivery was a couple of sets of wash-off 'tattoos'. Yellow Moon sell a number of different packs of these wash-on, wash-off temporary tattoos in designs to suit all tastes. Lara was absolutely fascinated by them and it makes her feel so grown up and because you get between 24 and 36 in a pack, they are really good value and one or two could be slipped into a party bag. All of the mums who come to the birthday parties we throw seem surprised that I have made our party bags and filled them myself rather than buying pre-filled bags but when there is such a wide range of cheap party bag toys available, it seems to make sense to build the bags yourself because you can choose toys that you know the children will love. At yellowmoon.co.uk you can get free delivery if you spend over £50 or it costs £2.99 for delivery if you spend less than £50. With every purchase you can earn between 5 and 20% cash back for a charity, school or group of your choice. Duracell are on a mission to power people to achieve some of their life long goals. Duracell sent me on a training course for me to try and learn the art of cake decoration so that I can make epic birthday cakes for my girls for ever more! I spent a full afternoon at CakeyPigg Originals near Reading where I got hands-on experience with several different types of cake decoration technique and I managed to produce some cupcakes and icing decorations far more intricate then I would ever have thought possible. First, I was shown how to make flawless buttercream and the secret art of applying it to a cupcake. Then I learned how to colour sugar using neat vodka (who would have thought it?) and I used the gently coloured sugar to decorate marshmallows and create this stunning chrysanthemum cupcake. It was great to learn about when and where to use different types of food colouring and now that I know how to colour my own sugar, I shall never run out of sprinkles for the girl's baking activities ever again. Next up was this delicate sugar rose. I still can't believe that I made this. Now I know how to do it, I can't wait to try it again and decorate an entire cake with them! Working with petal paste was very delicate work and was particularly tricky on such a hot day but I think it is a great skill to have learned and it has meant that I now know what some of my many decorating tools are intended for. I was left speechless when I took the rose home and Lara munched it down in a matter of seconds - my handiwork... eaten! Finally, we made this groovy sunflower cake. Sunflowers are by far my favourite flower so I really hope to be able to make more of these in the future. It was a great opportunity for me to learn how to colour fondant icing and also how to make and fill my own icing bag. I really enjoyed learning how to pipe the buttercream petals and it has re-ignited an interest in the piping bag and nozzles I recently inherited from my own mum. It feels great to have increased my confidence in working with icing and confectionary - now I can't wait to get started on my own creations. I already have plans for an epic Christmas cake. Duracell also sent me a book packed full of cake decoration step-by-step guides which had some stunning example cakes in it that Lara said she wanted me to make so I have plenty of cake challenges ahead of me. I certainly feel like, with the skills that Duracell have powered me with, I have broadened my cake-making horizons - just call me the cake-meister. It was a brilliant afternoon of one-to-one learning at CakeyPigg and I'd highly recommend it for any budding cake decorators! You can find out more about the "Power Me" campaign on the Duracell UK Facebook page where fans are encouraged to share their goals, get support from the Duracell community and for the chance to win a Power Boost from Duracell. I've been a fan of Photobox for years; Photobox are the only photo printing service I use these days and I place an order with them between one and three times a month. Usually I order prints of my favourite photos but occasionally I develop personalised cards for my family or create personalised gifts and this month I got the chance to make a really beautiful and unique gift for my Mum's birthday. Photobox asked me to try out one of their brand new range of photo gifts - something really very special. This is a Personalised IPad Keyboard Case which I designed online and which made a very special gift for my Mum who deserved a bit of a treat after a horrid illness. Ordering the case was really easy. I uploaded the photo I was interested in (in fact, I uploaded a few and tried them out to see which looked best). 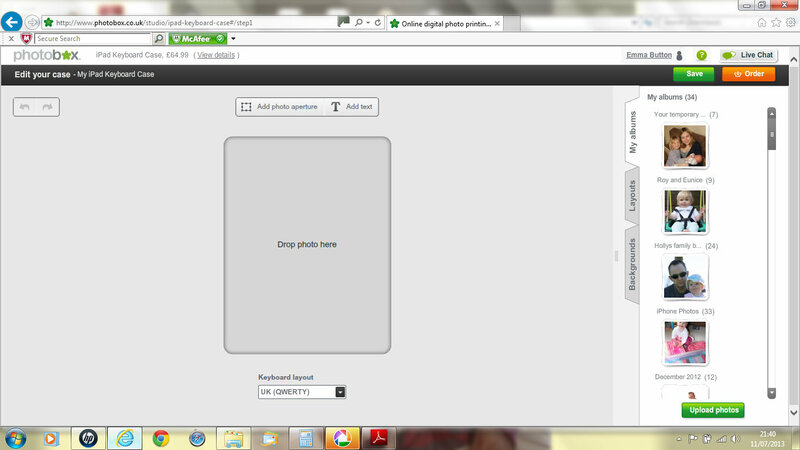 Then I used their online editing tool to select the picture I had chosen and size it appropriately. The tool let me choose the keyboard layout that I wanted. If I had chosen to, I could have embellished my design with further images or text but this time I wanted something simple and mature - the photo is of one of my parent's favourite holiday destinations. When I order online with Photobox, I usually pay by Paypal. Checkout is always really quick and easy and there are frequent incentives for me to come back at a later date to buy more! I received a confirmation email of my order and another one when my item was dispatched. 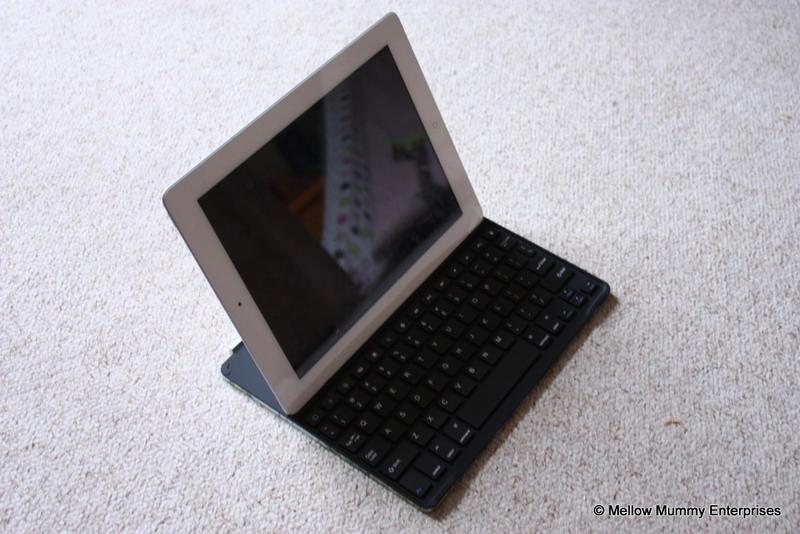 When the IPad keyboard case arrived, I was in awe. It really is a great gift that I know will be loved. When mum opened it, everyone in the room went "wow"! The colour reproduction wasn't as good as my standard prints (but I am a bit of a print snob!). Setting up the keyboard was really easy. After charging (using the USB charger supplied) she was able to connect it and was up and running in less than a minute and was merrily typing away! 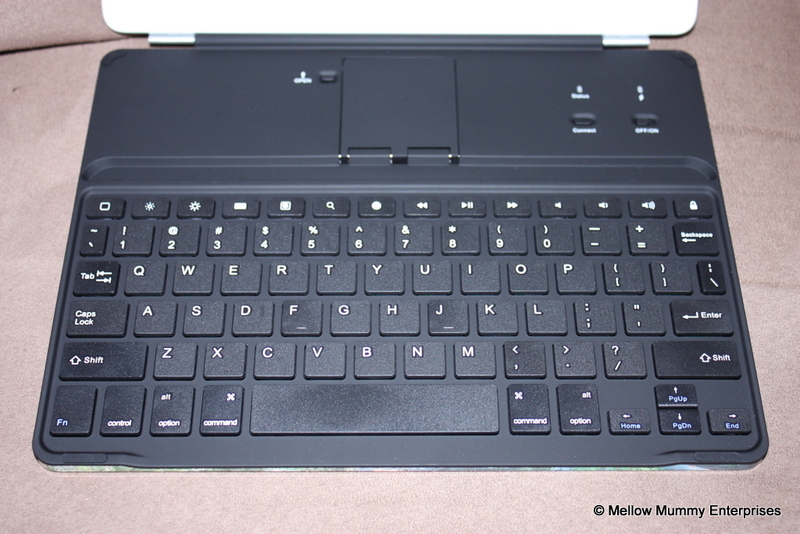 The keyboard communicates with your IPad through bluetooth. It attaches as many other IPad cases do, through a magnet, so there is a danger it may slip off if you open the flap vigourously. 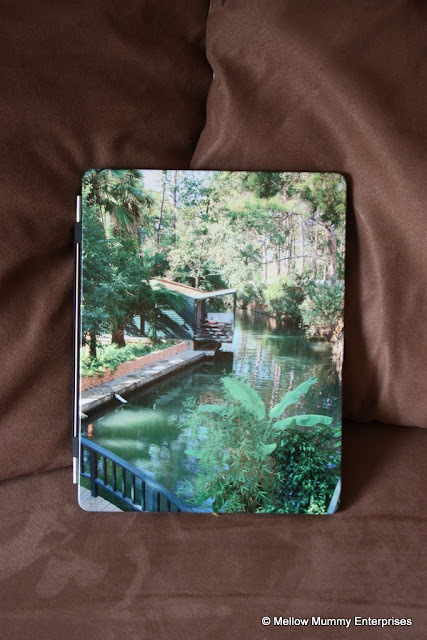 The cover flips over to cover the IPad screen and doesn't totally envelope the IPad. The keyboard is totally removable and there is a long thin slot on it where you can rest the iPad as if it were a monitor. My mum instantly reported that it was a lot easier to type on than the on-screen keyboard. The personalised ipad keyboard case costs £64.99 plus postage from Photobox and I think it makes a BRILLIANT photo gift. Earlier this month we were really lucky to be invited to a blogger event which took place at the Warner Brothers Studio Tour at Leavesden near Watford. While we were there, we had a chance to take the tour about the making of Harry Potter. It was an unforgettable experience that we all really enjoyed. When we found out a few weeks beforehand that we were going to be taking the Harry Potter tour, I decided it was time to introduce 4-year-old Lara to the Harry Potter movies. She had initially found them scary but was totally swept along by the school theme and the magical elements so she was REALLY really really excited when we arrived at the studios. I think that the Warner Bros. Studio Tour would be better suited to slightly older children but I don't think the magic was lost on Lara. I think a child who better understood the challenges of film-making and appreciated the difference between fantasy and reality would really be fascinated to see all of the different sets and costumes and props on display. And there were a whole lot of costumes and props! Lara most enjoyed seeing the different sets - the Gryffindor common room, the Great Hall at Hogwarts, The Knight Bus and Harry Potter's house. She didn't totally understand the concept of a green-screen to film against for special effects so I think the 'have your photo taken on a broomstick' area was a bit lost on her! Lara did though very much enjoy learning wand skills and hasn't stopped practicing them since! Elsewhere on the tour you can sample a glass of Butterbeer or take a seat in the Weasley's flying car. For me, I think the most magical areas of the studio tour were the set from Diagon-Alley and the final show-piece which is the full model of Hogwarts school. You first see the model in its initial concept drawings, then paper scale models and then finally you walk in to a beautifully lit room where you can walk around the school in 360 degrees as the music plays and the lighting changes. It was awesome. 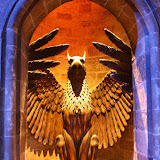 I think that the Warner Bros. Harry Potter tour is a great family day out for fans of the books and the movies and I think it is educational as well as just pure entertainment. Click on the image above to see my full set of photos from the day! Ribena 75th Birthday Bottle - The Winner! B-Sensible Bedding - A Great Travel Idea?